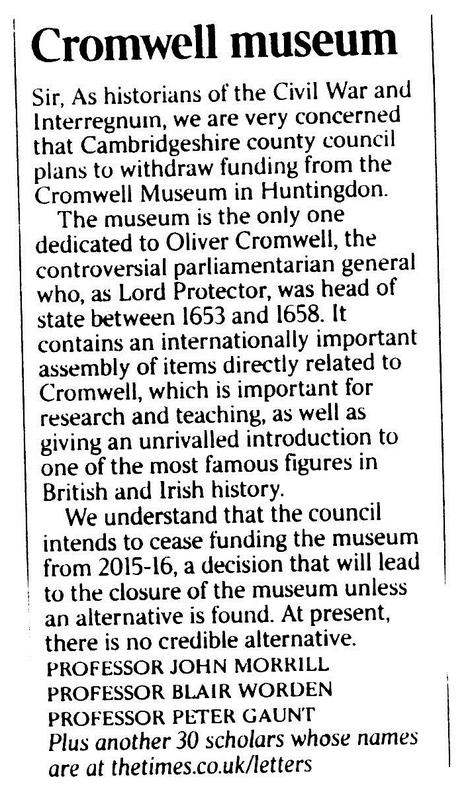 Today The Times newspaper has published a short article about the campaign along with a letter signed by 33 academics who are opposed to the Museum’s closure. We’re delighted with this significant national coverage and would like to thank those who both organised and signed the letter published today. This entry was posted in Uncategorized on January 28, 2014 by savethecromwellmuseum. Filming took place on Friday ahead of today’s signature collection in Huntingdon town centre. Many of those who signed the petition said that they were aware of the proposed closure of the Museum due to coverage received in local newspapers and regional television. Huntingdon was busy with shoppers today and the full count could again run into hundreds gathered in just a few hours. 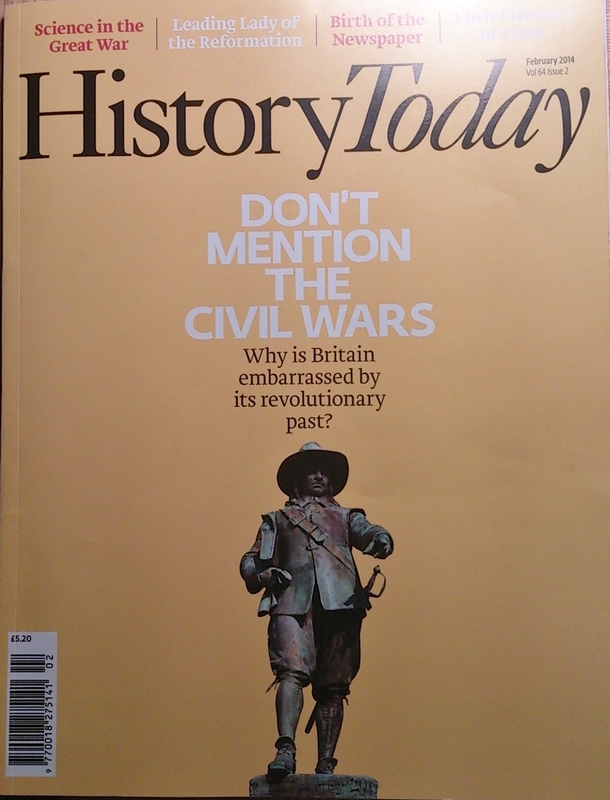 We will update you in the coming days on the total number of signatures received to the Cambridgeshire County Council petition, collating the online and paper copies – we have until 5 February to reach the target of 3,000 which will force a full debate of Council on the proposed closure of the Museum. Please encourage anyone you know who supports the campaign but who may not have signed the petition to do so as soon possible. This entry was posted in Uncategorized on January 25, 2014 by savethecromwellmuseum. 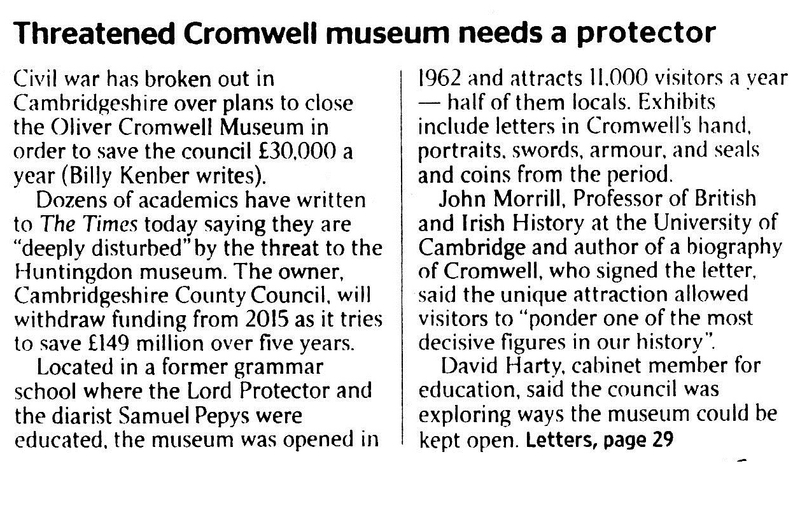 On Saturday 18th January the Friends of the Cromwell Museum will be collecting signatures on a paper copy of the Cambridgeshire County Council petition outside the Museum from 10.30am onwards. The signatures are mounting up on both petitions. The SurveyMonkey petition, which is open to everyone, has now received over 2,400 signatories from around the world – a fantastic achievement in such a short time. Today we are also pleased to announce that the Cambridgeshire County Council ePetition has received over 1,000 signatures from people who live, work or study in Cambridgeshire. However, we need more people to sign if the ePetition is to have the maximum benefit: 3,000 signatures would force a debate of full council and we have until the 5 February to achieve this number. Sadly, it appears that, to date, lobbying has had no effect on the Council’s proposal to remove the funding from the Museum. When the draft budget was discussed at the Cabinet meeting of the County Council earlier this week, no amendment was made. This means that the proposal to withdraw funding will now go forward to the full meeting of Council on 18th February. We can only hope that the proposal to withdraw all funding will be subject to amendment at the Council meeting. The Friends have been informed that a consultant has been hired to look at alternative options for running the Museum, with a reporting date in April. To take a final decision before learning the outcome of the consultant’s work would, we believe, be deeply regrettable. This entry was posted in Uncategorized on January 16, 2014 by savethecromwellmuseum.